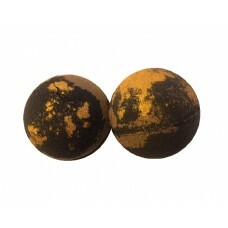 Large Bath Bomb with moisturizing oils and detoxing Sodium Bicarbonate and Clay. Scented with Mystical Woods fragrance oil. Pop one in the bath for a spa like experience. 3 Large Bath Bombs. 4oz each. Ingredients: Sodium Bicarbonate, Citric Acid, Kaolin Clay, Activated Bamboo Charcoal, Jojoba Oil, Fragrance Oils (phthalate-free), Gold Mica.